Read on to learn some of our top styling tips for curly hair, then try out one (or all!) of our four easy-to-achieve hairstyles for curly, frizzy hair. They work like a charm, no matter how you plan to style your hair. Tip #1: Say goodbye to your hairbrush. Tip #2: Comb from the bottom up. Tip #4: Get regular trims. Tip #5: Tend to your ends. Tip #6: Slather on a high-powered serum. Tip #7: Make a curly-hair cocktail. Tip #8: Reach for the curling iron. Tip #9: Try the pineapple trick. Tip #1: Say goodbye to your hairbrush. Because curly hair is so dehydrated and fragile, brushing it dry with a traditional bristle brush can wreak havoc on the hair cuticle. Instead, use a wide-tooth comb to gently comb out your knot. "It's much more gentle on the hair shaft, and won't cause friction or disrupt the cuticle," says Dave Stanwell. Tip #2: Comb from the bottom up. If you start detangling your hair from the top, you risk pushing the knots farther down which can cause breakage, unruly ends, and frizz. A better technique is to gently remove tangles from the bottom up, using your comb to tackle each knot one at a time. Tip #3: Mask it. Treating your tresses to a deep conditioning hair mask at least once a week will go a long way toward taming frizzy locks, especially if it's colour treated hair. Dave Stanwell suggests looking for products with ingredients such as milk protein and avocado oil, which quench curls by filling up the dry, thirsty holes in the hair shaft. Tip #4: Get regular trims. Getting a trim every six to eight weeks is essential for keeping hair healthy. It keeps split ends at bay, and makes curly hair more manageable and easy to style. Worried your stylist might chop too much off? "Ask for a dusting," suggests Dave Stanwell. "Whereas a trim typically involves cutting off length, a dusting never takes off more than a quarter-inch and targets only the messy, frayed ends." Tip #5: Tend to your ends. in between cuts, get rid of frizzy hair by using a leave-in conditioning spray right before you style, paying extra attention to your ends. Tip #6: Slather on a high-powered serum. "Hair serums are great styling products for curly hair, especially when you want to air dry," says Dave Stanwell. "They not only fight frizz, but also help define each curl and give them shine." For best results, drop a dime-size amount of serum onto your palm and rub your hands together, then distribute evenly to soaking wet hair. Tip #7: Make a curly-hair cocktail. If you find that straight serum leaves your hair limp, try creating your own cocktail by mixing a nourishing oil with your favorite styling product (such as a cream or mousse). While the cream or mousse locks your look into place, the oil hydrates your hair, seals the cuticle, and prevents your curls from feeling stiff or crunchy. Tip #8: Reach for the curling iron. 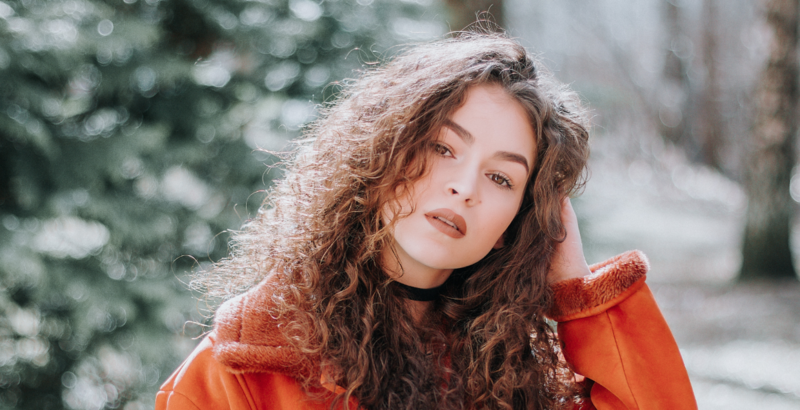 It may seem redundant to use a curling iron on curly hair, but it's actually a great tool for revitalizing saggy, limp locks in between shampoos. The trick is to use a thin barrel iron (no bigger than an inch) to gently curl any ends that have gone flat. Tip #9: Try the pineapple trick. If you want to prevent your curls from changing shape while you sleep, try the pineapple trick. Simply gather your hair into a high ponytail and secure it with a scrunchie. Let the curls fall naturally to each side (you'll look a little like a pineapple, hence the name), then cover them with a silk scarf or sleeping cap and hit the hay. When you wake up and remove the cap and scrunchie, your curls will still be intact. Tip #10: No touching! As tempting as it may be to play with your hair, it's something you really want to avoid. Touching your hair causes frizz, so once you're done styling, keep your hands off. 1. After washing and partially drying your hair (about 60%), distribute a palm-size amount of Luxurious Volume Perfectly Full Mousse from root to tip. Finish drying with a blowdryer and a hot air brush. 2. Pull your hair back and use an elastic to tie it into a loose, high ponytail. 3. Divide your ponytail into two parts, then pull them apart with each hand so that the elastic rises up, tightens the ponytail, and adds volume to the top of your head. 4. Finish by spraying both the top and ponytail with a generous amount of Luxurious Volume Forever Full Hairspray. 1. Apply one pump of Frizz Ease Beyond Smooth Frizz Immunity Primer to clean, wet hair. Let air dry or blow dry with a diffuser. 2. Part your hair where desired, then gather your hair together at the nape of your neck. 3. Twist and roll your hair into a rough, messy low bun. 4. Secure the bun with four to six bobby pins. Don't go crazy or worry if some pieces or curls stick out — the point is to keep it loose and natural-looking. Pull some pieces out in the front to frame your face. 5. Spritz on some Frizz Ease Moisture Barrier Flexible Hold Hairspray to set the chignon in place. 1. Using a wide-tooth comb, detangle your hair while you are in the shower and have conditioner on. Rinse out, but do not touch or towel-dry your hair (you may want to put a towel over your bathmat to prevent it from getting soaked). 2. Dispense a generous amount (at least two to four pumps, depending on how much hair you have) of Frizz Ease Dream Curls Air Dry Waves Styling Foam onto your palms and spread evenly throughout your hair. 3. Place a cotton t-shirt on a surface in front of you, then flip your head forward so that all of your hair is in the center of the shirt. 4. Place the bottom of the shirt at the nape of your neck and tie the shirt sleeves into a knot behind your head. Tighten the knot until it's secure and sit up. 5. Grab a book and chill for 20 to 30 minutes, then undo the hair wrap. Shake hair out and finish with a light mist of Frizz Ease Dream Curls Daily Styling Spray. This awesome no-heat hair drying technique, called plopping, will create bouncy, spiral curls that are thick and defined. 1. Spritz clean, wet hair with Beach Blonde Sea Waves Sea Salt Spray, then blow out using a hairdryer. Don't worry about getting it stick straight, what's most important is that the top is smooth. 2. Pin half of your hair up and separate the other half into small sections. 3. One at a time, wrap each section around a curling wand, holding it away from your face and above your hair so that the curls drop down from the barrel. 4. Section the top half and do the same, but avoid curling all the way to the root. Instead, start just above the ears. 5. Let the curls cool for about five minutes, then mist with Beach Blonde Sea Waves Sea Salt Spray and run your fingers through them to break them up.